In 1967, when Compañia Peruana de Cemento Portland changed its name to Cementos Lima S.A., thus entering a new stage in the business, which involved installing a new kiln, mills and packing line using the latest technology never before seen in Peru. Our Atocongo plant is 20 km. south of Lima, in the District of Villa María del Triunfo. Our Condorcocha plant is located in the District of Unión Leticia, Tarma, Junín. 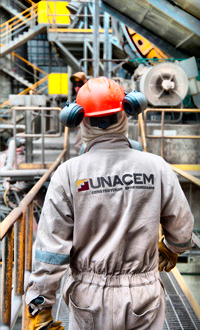 UNACEM has been committed to the sustainable development of Peru for more than 60 years. We value our people and our communities, which is why we work to high production and safety standards and control our environmental impact making efficient use of the resources in our quarrying, manufacturing and port activities. With such a vision, since 1996 we have had an Environmental Department responsible for improving the environmental performance of the organization and for ensuring that our projects and activities are sustainable. Furthermore, in 2003 we created Asociación Unacem (formerly Asociacion Atocongo), with a mission to implement the company’s social responsibility policy. Our more than 60 years of experience has enabled us to set up similar companies contributing to the growth of the construction sector and, therefore, the development of Perú. Our commitment extends to our subsidiaries, who pursue our mission and accept the challenge of not only generating economic value, but doing so in a sustainable and socially and environmentally responsible manner. Peruvian Technical Standards (NTP) and the US standards set by the American Society for Testing and Materials (ASTM), which apply to Portland cement. For the highest long-term strength and durability, better workability and better finish; a traditional premium cement. The market leader and UNACEM’s best-selling product. Backed by more than 40 years of experience, making it the best-known and most reliable brand in the market, it is also the freshest and most widely available. This is the most widely used cement by builders and self-builders in Peru. A hydraulic cement containing pozzolan, its main attribute is its resistance to efflorescence. Aimed at self-builders and builders who need a cement with a competitive price. This is a pozzolanic cement especially for areas where efflorescence is a problem. A specialty high quality cement, used principally where concrete with a high resistance to efflorescence is required. A pozzolanic cement. Its characteristics include reduced fissuring during curing and it produces a more impermeable concrete, which considerably improves liquid storage in concrete tanks, irrigation channels, etc. According to Peruvian Technical Standard 334.090, the net contents of a bag of cement should be 42.5 Kg. Unfortunately, some people illegally remove cement from the bags and sell them at a lower price. Our cements meet the standards and weigh the exact amount. Find our cements at more than 350 points of sale in the Progre-Sol hardware store network and through our authorized distributors in Lima and provinces.